Castor Games is a part-time independent game development company formed by two close friends who unfortunately don't have legions of followers yet :). But for those who find us, we want you to know we spend our time developing and testing ideas in the hopes that YOU will enjoy the results. Our goal is to build experiences that bring as much pleasure as we can cram into our code. Launched in February 2015, "Woodchippers!" was our first project and an invaluable learning experience in design, marketing, testing and perspective. "Woodchippers!" is an action adventure game and was an ambitious effort for our first product. Features include: multiple unlockable weapons, 16 unique infinite upgrades, leaderboards, achievements, and 40 different stages for hours of play with increasing difficulty modes each time the game is completed. We are proud of our first game and encourage those who have not already to give it a try for free, available from the Google Play Store. We hope you enjoyed this quick overview of who we are and what we're doing. Please feel free to share with any others who might enjoy what we offer. 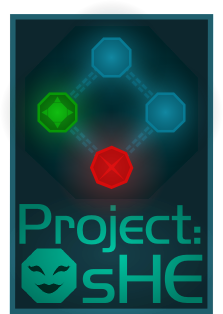 "Project: sHE" is right around the corner for release, so follow us, check out the game, and let us know what you think. Because in the end, we make these games for you.